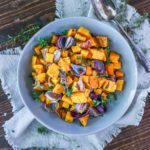 Baked butternut squash is a fantastic side dish, so easy and low maintenance. Great for a holiday spread or any time of the year! Carefully peel squash. Trim off each end. Slice it in half short ways, just above the bulge. Slice each piece in half, scooping the seeds out of the bottom halves. Toss with olive oil and seasonings. Place on a lined baking sheet, being sure there is room between the pieces of squash so they can roast and not steam. Bake for 30-40 minutes, until the squash is fork tender and the outside is crispy. This recipe is easily scaled up or down, just remember that if you increase it to give the squash enough room and that the sheets aren't crowded.